Drzewiecki Design is a company specialising in scenery design for flight simulators, and have been since 2003. The present company was established in 2006 by Stanislaw Drzewiecki who heads up a team of specialists worldwide. They design scenery for FSX, Prepar3D as well as X-Plane. Undoubtedly, if you are a seasoned flight simmer, you would have come across their work before with the likes of Polish Airports volumes 1,2 and 3, Warsaw City X, Baku X, Miami City X, Moscow City X and New York City X.
Washington X continues their "City X" series concept, with an advanced model of the compact, diamond shaped city, 5 nearby airfields in various resolutions, and a large photoreal area surrounding the city. This scenery works along with SODE (SimObject Display Engine) to control seasonal vegetation as well as jetway animation. Washington, District of Columbia, is the capital of the United States of America and the federal government. The city is popularly known as "D.C." in the country. The national capital is not located within any of the US states as the US Constitution defines the region as a federal district. Comprising a total area of 68.34 square miles, the District lies on the northern edge of the Potomac River between the states of Virginia and Maryland. Located in the Mid-Atlantic region, it borders Montgomery County (northwest) and Prince George's County (east) of Maryland, along with Arlington County (south) and Alexandria city (west) of Virginia. The District has 7,464 acres of parkland that includes the National Mall and Memorial Parks. The Smithsonian museums, national museums, presidential and war memorials, Capitol Hill, Washington Monument, White House, and Washington National Cathedral are some of the most visited attractions in the city. Highly advanced performance-friendly design, numerous optimisation techniques used as well as the Lite Texture Pack provided. Washington X is available as a download only product from most of the popular online flight simulation stores including JustFlight, Aerosoft and simMarket. As a guide, the product is priced at £19.99 from Just Flight or the equivalent on currency cross rates. The download size is a hefty 1.4GB so using an internet download manager is recommended. The installed size on my hard drive amounts to 2.01 GB using the highest resolution texture files and I would expect the "lite" quality textures download to take up a lot less space. The installation is fully automated andthe user can select the features suitable for them, when selecting a feature, a useful narrative describes the feature and possible memory and Virtual Address Space (VAS) implications, If, However, you have chosen the features you like and find it they are too taxing for your setup then simply run the installer again, and change the options. There is s second part to the installation which is to download and install the latest version of SODE and setting it up within its own installer. The image below is my interpretation of the scenery coverage along with the locations of the other enhanced airfields included with this scenery. Within the map coverage there are other default flight sim airfields, but for the purpose of this review they are not marked. The red diamond shape marks the physical limits of the city. Most of the dense, high quality objects, are concentrated within, and within the National Mall, Presidents Park, and downtown Washingdon. Overall - The underlying ground photoreal imagery used in the scenery is a derivative artwork based on orthophoto imagery produced by the U.S. Geological Survey, as well as commercial orthophoto imagery created by Harris-Mapmart. This imagery does a good job at medium to high altitudes and the scenery has enough buildings, autogen and vegetation to cover the lower quality photo image beneath. If sightseeing and flying at or below 500 ft, then they become blurry, but that is not a critism or fault with this scenery, it's endemic within photo textures. The blend into the surrounding scenery is seamless, I am using underlying layers of Orbx Landclass and Vectors and there doesn't appear to be any conflicts. The user manual, however, does make a point of saying this scenery is not compatible with sceneries of the included airports in this package. I can only think that Ronald Reagan Airport and Andrews Joint Forces Airbase would come into that category. Inner City - With about 1500 custom-made buildings including the whole downtown in 3D, plus landmarks, bridges, stadiums, harbors/marinas and other objects. My eyes were popping at all the points of interest objects included, even as foreign tourist I recognised so many of the buildings as the modelling is superb. Of course, the main sight seeing attractions are there in high detail and even show President Donald J. Trump, VP Pence and Melania Trump in the Oval Office. You can spend literally hours scanning the streets and buildings capturing somthing new every time. I toured in a helicopter but I guess the P3D Avatar would give a whole new perspective. 1600 Pennsylvania Avenue NW aka "The White House"
Outer City - There is plenty of interest and some highly detailed buildings away from the city centre, like the Pentagon and Washington National Cathedral. Further afield there are hospitals like the Sibley Memorial and the Medstar Washington Hospital Center which have some amazing detail. From nearly everwhere in this scenery you can see a plume of black smoke coming from the southbound carriage way of South Capitol Street. On closer inspection the drama unveils to reveal a tanker on its side and well alight. The crash site is surrounded my emergency vehicles and onlookers standing by their cars. Unfortunately, as I have seen else where, the default AI traffic interferes with the custom models by driving straight through the scene and through the objects. Unfortunately I came across this happening at the intersection of the Arlington Memorial bridge and on occasion the road traffic started heading skywards. This doesn't happen every time but does require a restart of the sim. That aside, I am sure I haven't discovered everything, every once in a while a new custom object appears which I have never seen before. Main Airport - Ronald Reagan Washington National Airport (IATA: DCA, ICAO: KDCA) is situated 3 miles (5 km) south of downtown Washington, D.C. in Arlington County, Virginia. At just over 200 ft high, from the control tower you can clearly make out the taller buildings in the city. The airport comprises of three terminals, A,B and C. You can freely walk inside these terminals as generally they have been modelled with typical shops and cafés, such as Starbucks. You can also see check in and security desks, seating, stairs and all terminal related paraphernalia. The terminal has tall glass windows so you can see all the comings and goings on the apron. The whole experience though is eerie as there are no humans anywhere, even if they were 2D objects they would inject a bit of realism. The apron is literally packed with aviation clutter, such as buses, baggage carts, trucks, push back trucks and many more vehicles you would expect to see air-side. All of these objects are static and I did find that if the airport vehicle traffic is set too high then the AI can interfere with the static objects. The static aircraft are not high poly models but are perfectly acceptable in this situation. Other extras air-side are the addition of SODE controlled jet-ways, which are well animated, and wet look tarmac and taxiways which help brighten up a rainy day. The airport lighting is very atmospheric on approach, the terminals are well lit internally and everything can clearly be seen from outside. The apron lighting (except one ramp) comes from low level spotlights on the buildings, it took me a while to realise this as there are no tall lighting posts. Runway and taxi lights are spot on and the approach and lead in lights to Rwy 01 are superb, and if you want, you can switch the lights on manually in the day by tuning Nav2 to 112.0. Land Side - There plenty of high quality buildings including car parks, ramps and an elevated rail track featuring a couple of static trains. In the nearby town there are more complex buildings featuring hotels and other commercial buildings. Drzewiecki Designs have used some artistic licence in including their logo on the sides of some of the buildings which adds some extra interest. Such is the detail and modelling, this airport and and its environs would stand alone as a very good product. 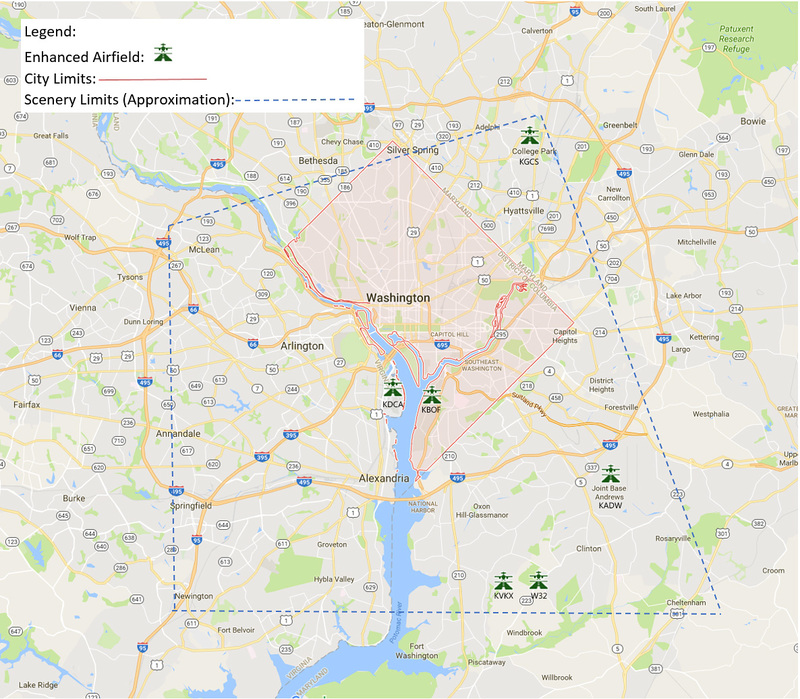 Other Airports in the Surrounding Area - It's worth heading out to the other "lite" airfields, especially Joint Base Andrews (ICAO: KADW) a United States military facility located to the south east of the city. The base is widely known for serving as the home base of two Boeing VC-25A aircraft which have the call sign Air Force One while the President of the United States is on board. Both of these aircraft are modelled, one with several vehicles and Secret Service agents waiting next to the aircraft. Also on the apron are many Sikorsky helicopters and a line up of Lockheed F22's. The Airport buildings are of a lite nature giving the right impression without using up precious memory. Moving on, we have College Park Airport (ICAO: KCGS) which is a public airport located in the City of College Park. It is the world's oldest continuously operated airport. This is a nice little location, several light aircraft on the apron and a resident helicopter. One of the more interesting features is the inclusion of a (static) train running past, yards from the threshold of Rwy15. Next up, Potomac Airfield (ICAO: KVKX) is a privately owned, public-use airport located in the community of Fort Washington (formerly known as Friendly). It is a general aviation airport with no tower. Included are numerous aircraft sheds and many Cessna's waiting for a flight. Again, not the highest detailing but good enough and a nice little destination to fly in to. Joint Base Anacostia–Bolling (ICAO: KBOF) is a 905-acre (366 ha) military installation sat on the opposite side of the Potomac River from Ronald Reagan International. Its runways were deactivated back in 1962 due to traffic pattern issues with the nearby KDCA, then Washington National Airport. What remains now is a fairly large facility with a 100 by 100 ft (30 by 30 m) helipad. There are more custom buildings of a lite nature to add interest which makes this an an ideal base to start your city sight seeing tour. Finally, Washington Executive Airport (FAA LID: W32), also known as Washington Executive Airpark or Hyde Field, is a public use general aviation airport just a short 1.27 mile hop from the smaller Potomac Airfield. With a 3000 ft (914 m) asphalt runway it makes an ideal GA stopping off place. There are static Cessna's scattered around with two on the apron outside what looks like a club house. There are many aircraft sheds and a couple of blister hangars. As with the previous airfields, lite quality textures are order of the day and look fine in this situation. Helipads - There are around eight helipads to find, some are obvious, like the Whitehouse lawn or the Police Department Air Support Base, others, like the Georgetown Hospital base are not so, but it is great fun exploring and really helps to hone those hovering skills! Washington X offers full seasonal support. The SODE engine is used to switch the seasonal colours to the custom trees and vegetation, the default trees and vegetation swap too, but indepentently of SODE. The base photo textures swap out to the bright textures of summer to darker textures of autumn and winter then on to white for hard winter. Washington X delivers a high level of quality in the main buildings around the airport, and the city centre with the emphasis on quality on monuments and Federal buildings. Touring the central parks and buildings is a jaw-dropping experience such is the quality. The outer regions are good as well with the odd gems like the hospitals showing some excellent modelling. The lite airfields are of a perfectly acceptible quality given what else is in the scenery, and are very useable. I did find a few texture anomolies with signs on buildings and at the Nationals Stadium being reversed. In the terminal there are some textures missing completely from the skylights so you can see the sky directly through the roof inside the terminal. This is one of the most surprising aspects with this scenery. I have a couple of other city sceneries including New York X which for me was virtually unplayable at high detail. Washington X is different, even using extremely dense scenery complexity, very dense building density, and with HDR lighting, touring in the Milviz MD-530 helicopter was a joy. No stuttering, freezing or black textures were experienced. However, I felt the sim was running on the ragged edge of memory. I could force an out of memory error by changing seasons and aircraft whilst in the highest density areas. This tells me this scenery is very well optimised. I never flew with a complex heavy aircraft, I expect at the higher graphic settings you may run into trouble and need to rein back the density settings. A simple document, 1 cover page and 3 pages of information cover the background to the city and all the the included airports. There are short paragraphs about compatibility and installation included but no advice on recommended sim settings. For charts, a link to Skyvector is provided. So how much scenery would you expect to get for twenty Quid? A medium to to top quality airfield? How about everything I have described above giving hours and hours of repeated entertainment. Well in my book Washington X is excellent value for money, end of story. Washington X is for FSX / FSX SE / P3D only. No other specified technical requirements are published. Additional Major Add-ons. Active Sky Next, Orbx FTX Global BASE, Orbx FTX Global VECTOR, Orbx FTX Global openLC series, Orbx FTX region series, Orbx FTX airport series, and Orbx FTX Trees HD. Also used is PTA V2 shader addon. Having spent a few weeks exploring the city, the main airport and the extended scenery area, I think this rates as one of Drzewiecki Design's best offerings. Plenty of thought has gone into the location, and the attention to detail is superb. There are a few minor anomalies such as the reversed signage and missing textures, but they are not major defects and did not affect my enjoyment. It's definitely a location I will explore a lot more and I would thoroughly recommend it to our readers. A superb offering from Drzewiecki Design, a top quality product in every way. 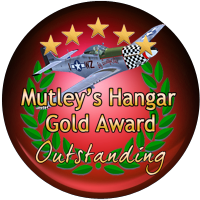 with an "Outstanding" and a Mutley's Hangar Gold Award.